If you’re a germophobe, Boeing plans on making your life a bit less stressful with the company’s new self-cleaning aircraft lavatory concept. With all the impressive technology we have these days, it’s about time something like this was developed. 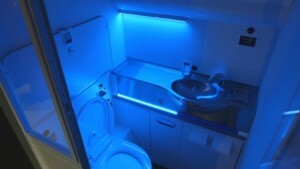 According to Boeing, when a passenger leaves the lavatory, the motorized toilet seat automatically lifts up, then special lights fill the entire room in the form of bacteria-killing far ultraviolet radiation. In addition, the flush, soap, faucet, dryer, and seat controls will all be touchless so you can avoid direct contact with all the other gross passengers you’re forced to share a plane with. At the moment, the self-cleaning aircraft lavatory is merely a concept but one that Boeing expects to fully commit to after the company conducts further research.